This is a follow-up from an earlier post and video lecture explaining how to use MEAL paragraphs as routine writing tasks that help students build stronger body paragraphs. Many classes start with a “Warm Up” that is used to hook students into the lesson, or in this case textbook. In order to use MEAL paragraphs in this fashion, the instructor merely needs to pose an arguable question that requires students to take a position, then find three pieces of textual evidence and explain how the evidence supports their main idea. Finally, they link their evidence and analysis back to the main idea of the paragraph. 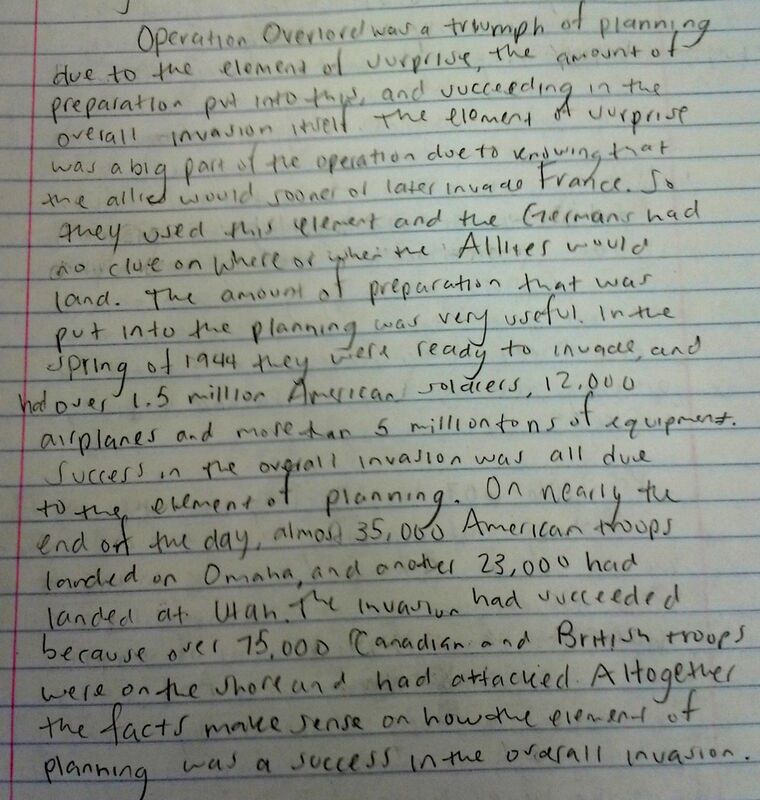 For these examples, my questions were: (1) Was Operation Overlord a triumph of planning or a lucky break? and (2) Should island hopping be considered a success or failure? This student does an adequate job with the MEAL format, below you can see their main idea highlighted in yellow. It is indeed a thesis that takes a position on the question and provides three reasons. I am eager to read on. Unfortunately, when highlighting the evidence in turquoise, I realize this writer only provides two pieces of evidence for their thesis. I hunt for textual evidence that the allies have succeeded in completing the first part of their plan, but I can’t find any. Therefore, I stop reading. This is not the perfect MEAL paragraph. So unfortunate. This student had a strong thesis, solid analysis, and even restated their thesis at the end of their paragraph. They just needed to include one more piece of evidence to get the points on this quickwrite. The next student sample on island-hopping is similarly well-organized. The main idea is highlighted in yellow. The evidence is highlighted in turquoise. The analysis is in green and the thesis is restated at the end of the paragraph in purple. Aside from a slight redundancy in swimming to shore and fighting the Japanese in trenches (not factual), this author has created a solid MEAL paragraph. This sample can be used as a mentor text when showing students how to write MEAL paragraphs. I have found some students will copy your model word for word, so it helps to have a supply of examples that aren’t on the topic you are asking your students to write about. MEAL paragraphs should be an arrow in every effective educator’s quiver. Students who repeatedly write MEAL paragraphs gain extensive practice in identifying and explaining textual evidence. You will see an immediate improvement in their writing. Please feel free to leave any comments about integrating MEAL paragraphs into your everyday classroom practices. 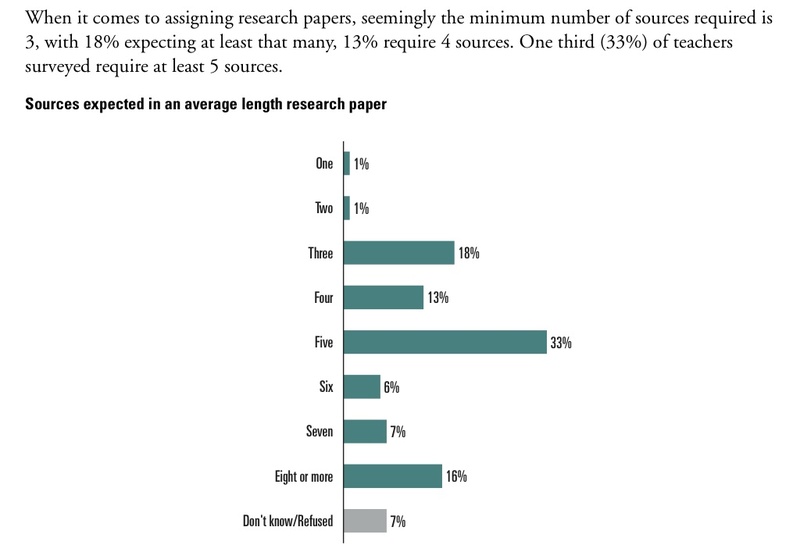 A study from The Concord Review found that 62% of teachers never assign a paper of 3,000-5,000 words in length, and 81% never assign a paper of over 5,000 words. 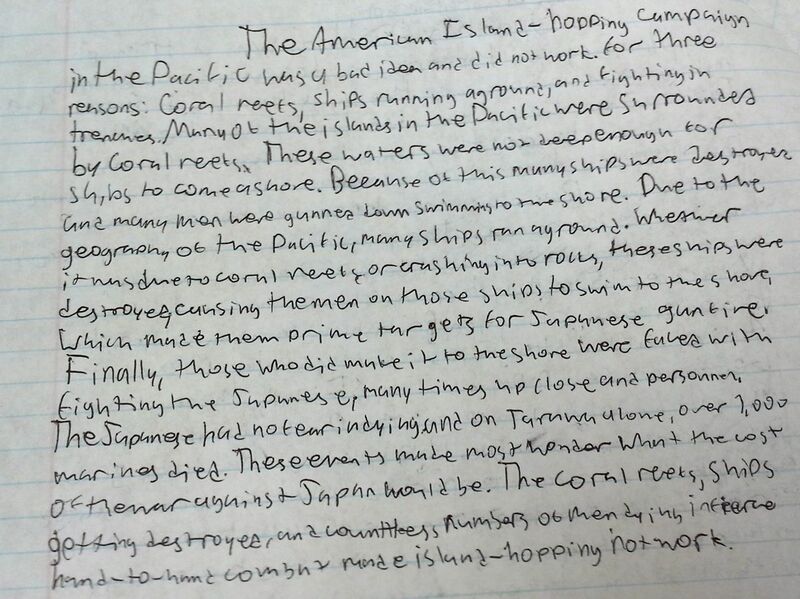 For this project, students combine three of their in-class writing assignments into a five-page (1,250 word) paper that argues: (1) which side was most responsible for the Cold War, (the Soviets, or the West); (2) elaborates on which events defined the Cold War; and (3) describes how the Cold War should be remembered in textbooks. Students will support their positions with evidence from the documents provided and independent research. Use parenthetical citations, i.e., (Cold War Causes, Handout 1), (Soviet Textbooks DBQ, BGE), or (Containment DBQ, Doc. A), and include a Works Cited page at the end of your paper. For your final grade, you will provide a one-page revision memo, a typed final draft on top of the original drafts, and four www.PaperRater.com reports all stapled together. Save this project in your Google Drive and use it for your senior portfolio. Which side was most responsible for the Cold War, the Soviets or the West? Include an introductory paragraph that contains background on the Cold War and a thesis statement that takes a position. Explain the three main underlying causes of the Cold War and who was most responsible for the Cold War. Justify this decision by explaining who was least responsible. Include evidence from at least three documents to support your ideas and explain how the evidence proves your point. Lastly, provide a concluding thought that reconnects with your thesis. How did the United States prevent the Soviet Union from expanding communism? After reading about multiple Cold War events (Long Telegram, Berlin Airlift, Korean War, and Cuban Missile Crisis), define the US Cold War foreign policy and describe three instances where containment was used. Choose which example was the most significant and explain your reasoning. Describe how the Cold War should be remembered in future textbooks. Which Soviet accomplishments and which US accomplishments should be included in future history textbooks? Explain your reasoning. Conclude the paper with some final thoughts on what lessons the global community should learn from the Cold War between the US and the Soviets. It is addressed to me. It points out what your focus was on this draft. It lists the strengths and weaknesses in your previous drafts. It details the changes you’ve made from one draft to the next. It describes your overall impression of the revision (strengths and weakness). Each of these points must be in the memo. Typically, memos run anywhere from one to three pages in length. The final paper should include page numbers on the bottom right-hand side of the page, be formatted in Times New Roman 12 point font, double-spaced with one-inch margins. The final document should contain a cover page and be turned in before the end of school on Friday, May 15, 2015. This entire project, which began on March 20th is worth 700 points of your final grade. CA State Standard: 10.9.2 Students analyze international developments in the post-WWII world. 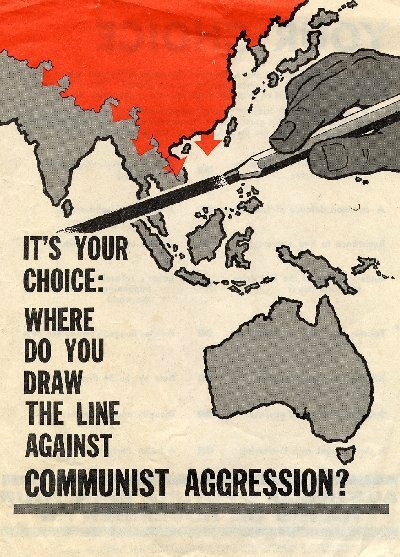 Analyze the causes of the Cold War with the free world and Soviet states on opposing sides. Describe the competition for influence in Germany, Korea, and Vietnam. Common Core Writing Standards: 1. Students will write arguments to support claims in an analysis of substantive topics or texts using valid reasoning and relevant and sufficient evidence. 5. Develop and strengthen writing as needed by planning, revising, editing, rewriting, or trying a new approach. 10. Write routinely over extended time frames with time for research, reflection, and revision. What should be remembered in Soviet textbooks? Describe three achievements that should be included in Soviet textbooks. Support your reasoning with evidence from the documents: (A) Geographic Expansion; (B) Socio-Economic Accomplishments; (C) Great Terror; (D) Political Repression; (E) Military Strength; (F) Space Achievements; (G) Olympic Victories; and (H) Ballet & Cultural Achievements. 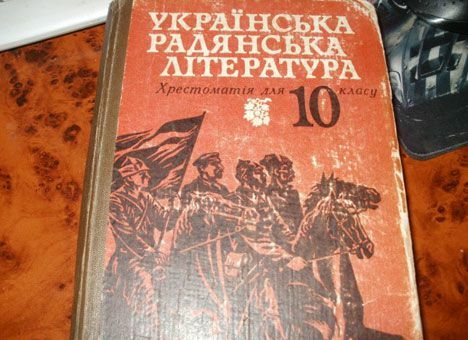 Soviet textbooks should include: ____________, _____________, and _______________. In 69 years as a country, the Soviet Union accomplished many great things, _________, _________, and _________; should be included in their textbooks to remember this time in history. _________, ___________, and _____________ show that communism was capable of producing greatness, this paper will argue that the Soviet Union’s Cold War accomplishments should be included in their textbooks. L – Link: How a Paragraph Fits in to what the paper is trying to prove. Poland was an East European satellite country of the Soviet Union (Document A). Based on this evidence, it appears that _____________________. This quote suggests that ______________________. When viewing the map, it is evident that _____________. This source reveals how US policy makers thought about ___________________. This timeline illustrates how ____________________________. This passage provides some insight into the nature of __________________________. Define the US policy of containment. Discuss three instances of containment from the documents and argue which serves as the best example of containment and which serves the worst example of containment. Evaluate whether containment was an effective or ineffective policy. Be sure that you use in-text or parenthetical citations when you use evidence from the documents. Three examples of Containment are: ____________, _____________, and _______________. _________, ___________, and _____________ provide historians with instances of the US Policy of containment, this paper will argue that ____________ is a strong example of containment, while ____________ is a weaker illustration of containment. Based on this document, it appears that _____________________. This document suggests that ______________________. This source reveals how US policy makers thought about ________________. This quote provides some insight into the nature of __________________________. Lastly, here are some videos that help you understand the documents better. Valiant Hearts, Mission-US, Call of Duty, Civilization, Age of Empires, Medal of Honor, Soldiers: Heroes of WWII, Axis and Allies, and The Calm and The Storm: these games have sold millions of copies, yet most History teachers have never played even one of them. Are video games a waste of time and energy? Can video games teach us History? 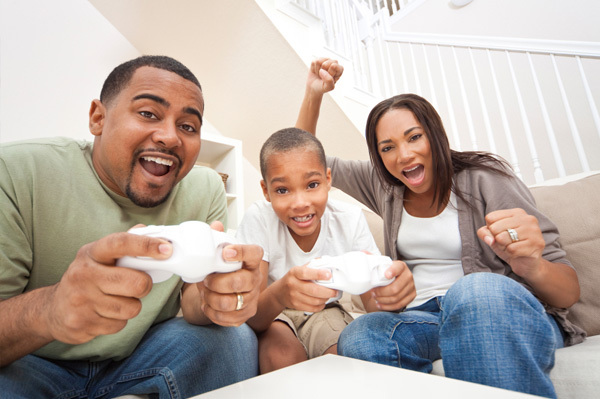 Niall Ferguson, a prominent historian thinks so, read his argument, however, please understand that other researchers urge caution about the appropriateness of video games for certain ages and purposes. Next, identify the state standard involved in the game you have selected. Then review a history-based video game in at least 500 words. Argue that the experience has taught you something meaningful about history. Your review should describe the story at the heart of the game, link the historical content in the game to your textbook, and describe how it confirms or contradicts what we have studied in class. Comment on the historical accuracy, or inaccuracies in the game as well as the level of difficulty in playing it. How many hours did you spend playing it? How many hours will it take to become a good player? Who would benefit from playing this game? Age? Demographics? How could the author target that audience? Report on who published the game. What other games have they made? How many copies have been sold? How much does the game retail for? Where can you get the best deal on it? Make sure this review follows the traditional essay format. Your teacher will submit the best reviews for publication in the school newspaper. You have between April 8 – May 1, 2015 to submit your review to http://www.PaperRater.com and you can improve it as many times as you want. I will review your final draft along with the PaperRater report. You may submit them electronically to scottmpetri@gmail.com or print them out and hand them in during class.